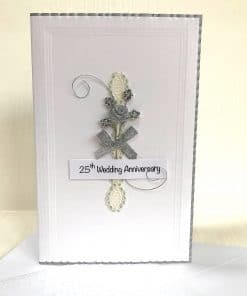 This beautiful handmade card makes a very stylish wedding anniversary card. A delicate pink paper rose is entwined with silver iridescent gypsophila (baby’s-breath). This is laid on lace ribbon which is mounted onto a white card that has an embossed border. This card comes with the wording “Happy Wedding Anniversary” on the front. If you would like a personalised message then enter the details before adding to your basket.